Hidden Italy has been organising walking tours in Italy since 1993 and was one of the pioneers of small group active tourism. Its first guided tour was based in Montalcino in southern Tuscany. 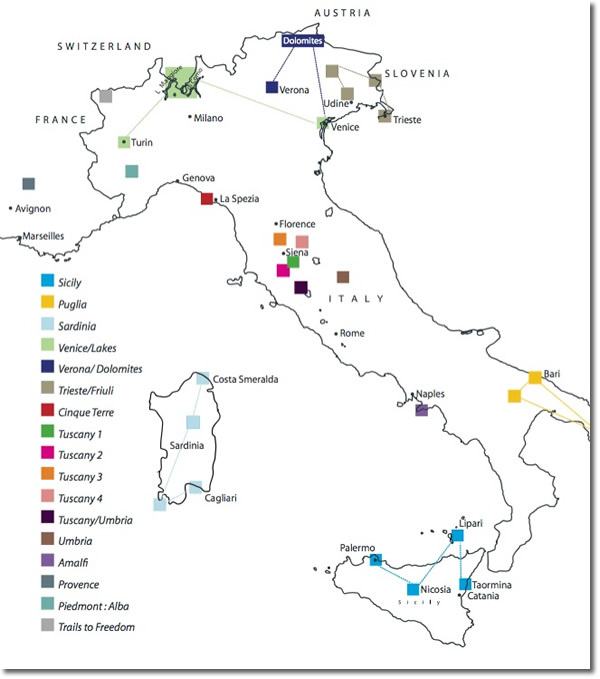 Since then, Hidden Italy has taken people to many different parts of Italy, from the Lakes in the north to Sicily in the south and lots of places in between, including Liguria, Tuscany, Piedmont, Lazio, Umbria, Dolomites, Sardinia, Friuli and the Amal coast. The idea for Hidden Italy came during the six years that Director, Simon Tancred, spent living and working in Milan in the 1980s, when, to escape the bustle and smog of that wonderful city, he went walking in the surrounding mountains, along the rivers on the Po plain or along the coastal paths of nearby Cinque Terre. For Simon, there are still few greater pleasures than entering the walls of an ancient Italian town after a good day's walk, with the prospect of a fine meal and a warm bed in front of him. The original idea for Hidden Italy was to share this experience. Hidden Italy has grown but its philosophy remains the same: to provide you with an enjoyable, hassle free holiday that will give you a genuine insight into this fascinating country. Hidden Italy is based in Sydney, Australia, and its operational manager is based in its Italian office in Florence, Tuscany. Hidden Italy has been organising and taking tours to Italy for twenty years. It is proudly family owned, managed and operated. Every aspect of the tours is personally selected, monitored and reviewed. Hidden Italy doesn't outsource or use third party services! 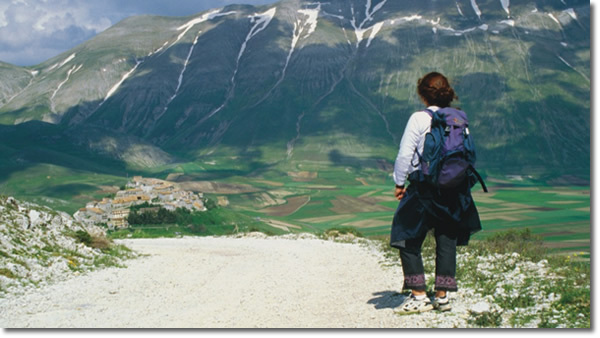 Hidden Italy specialises in walking tours in Italy. Hidden Italy doesn't try to be all things to all people but stick with what it knows best - Italy. The pace of the guided tours is relaxed (it is a holiday after all!) and gives you plenty of time to unpack and soak up the atmosphere of the places we visit. Hidden Italy's guided tours go to places that are well off the regular tourist trails and focus on a single region which has its own integral history and cultural traditions. Hidden Italy's guided tours travel in small groups (from seven to a maximum of fifteen guests) which means that you can move discretely. Hidden Italy's self-guided tours are continuous walks taking you from A to B - there are no shuttles or buses! Just pull on your boots each morning and set out - Hidden Italy will look after the rest. Hidden Italy's self-guided walks are safe: there is always a farmhouse in sight; each walk is GPS way-marked and you have 24 hour local telephone back-up. As the self-guided walks are often in out-of-the-way places, Hidden Italy includes private transfers at the beginning and end of each itinerary to the nearest major train station. The tours are supported by local drivers who move your bags each day, who are also available should you wish to shorten or miss a walk. People who ordered Hidden Italy Walking Tours also ordered the free travel brochures below. Click on the images to find out more about these brochures.